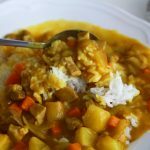 Today it’s time for another simple and delicious recipe: Korean-style curry rice (pronounced ka-re-raiseu in Korean, using 2 borrowed words from English, curry and rice). It’s quick to make and warm, hearty, and filling. It has just a few simple ingredients, and pretty much anyone can make it. When I was in university, my friends and I used to make curry rice all the time when we went camping. We would coordinate all the ingredients, kitchenware, and a small burner. Each one of us would have a job for making the meal: cleaning, chopping, stirring, making rice, etc. If it was a one night trip, the meal on the next day was usually kimchi and mackerel camping stew, and if it was a two night trip, we would bring enough rice, potatoes, and onions for doenjang-jjigae for the third day. Adding warm rice to any of these stews made it an easy-to-eat one-bowl meal. Every meal turned out delicious, and we all had fun cooking and eating. And of course we never ran out of topics to discuss, no matter what we were doing. 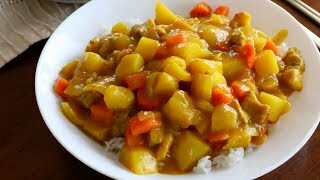 The curry powder that you need to make this dish is imported from Korea and can be found in a Korean grocery store. It has varying levels of spiciness: spicy, medium, and non-spicy, so everybody can enjoy the recipe. Make it with your family or friends and let me know how it turns out! In a bowl, mix the curry powder with ½ cup water. Set aside. Heat the butter in a large heavy pot over medium high heat. When it starts to melt add the pork and stir for a few minutes until the pork is no longer pink. Add the potatoes and stir for a few more minutes until the potatoes turn semi-translucent. Add the carrot and onion and stir for a few minutes. Add 2½ cups water, stir a few times, cover, and turn down the heat to medium. Cook for 10 to 12 minutes until the potatoes are tender. Add the curry and water mixture to the pot. Stir well for a few minutes until the sauce is creamy. Remove from the heat. Ladle the curry sauce on top of fresh rice and serve immediately with kimchi. Posted on Sunday, August 30th, 2015 at 4:18 pm. Last updated on July 26, 2017. Posted December 5th, 2018 at 11:22 pm | Log in to reply. This recipe was originally posted on August 30, 2015 at 4:18 pm by Maangchi. It was last updated on July 26, 2017. The video was watched 1,081,504 times on YouTube & has 19,861 likes!